The New Vhit Reload II e vaporizer comes in a solid cardboard box with a magnetic lip to open and close it. The atomizers are made with a metal/stainless steel cover, featuring a wild peacock design on it. The Vhit Reload II e vaporizer comes with a coil inside of it, along with two extra coils on the side. Unlike the original reload, the coils in the reload 2 show no wick and are just flat stove burner coils, allowing for a cleaner and more potent hit. There are four components to the e cig vaporizer: The coil, the metal base that holds the coil, the metal body, and the tip/ mouthpiece end. The mouth piece itself is able to push downwards, allowing you to gather any loose dry herb and push it back into the coil region. (Repacking it tighter). The box set comes with a little brush to clean out any residue or ash in the atomizer, as well as for cleaning the coil. Attach the mouth piece onto the metal body. Flip the atomizer so that the mouth piece is facing down and the opening on the top gives you a bowl shape to fill with dry herb. **Make sure that the dry herb is finely ground before filling the atomizer, as filling the atomizer with dense and compact dry herb may damage the coil and will not allow you to have a good vape amount. ** Looking at the atomizer through the bottom hole, you will see a silver ring that extends inward, that ring is your fill mark. Taking any small sized object (pen, paper clip, utensil, etc.) pack in the dry herb. Make sure your coil is comfortably tight in the metal base. 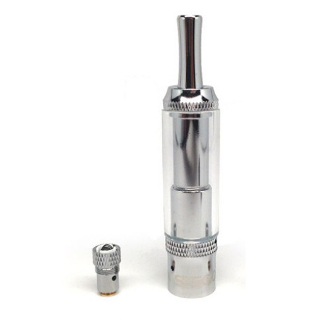 While your e cig vaporizer is still upside down and now filled, attach the metal base to the atomizer body. Flip it back over and push down the mouth piece to complete the packing of your atomizer. If you’re met with some resistance, that's a good thing as the dry herb is now surrounding the coil. But if there is too much of a resistance, than you have filled it too much, and must remove some of the dry herb. After you are finished filling your e cig vaporizer VHIT RELOAD 2, you may now attach it to your battery and begin to vape.